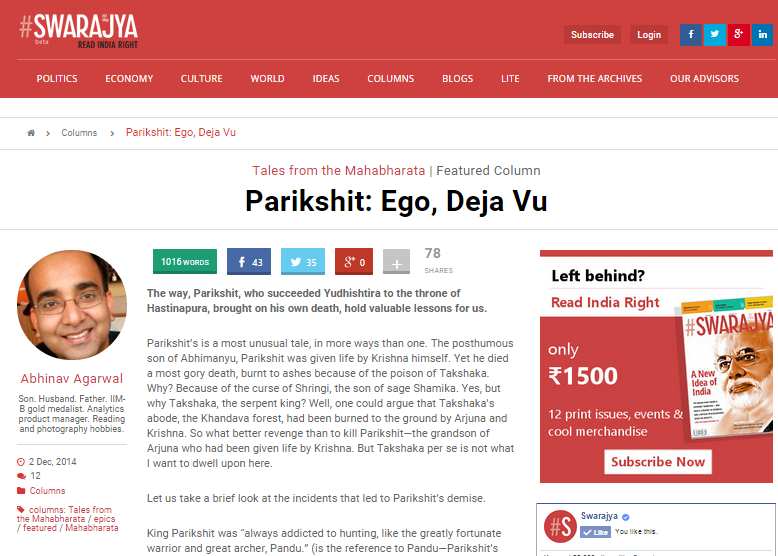 My fifth installment of "Tales from the Mahabharata - Parikshit: Ego, Deja Vu" - was published in the Swarajya Magazine on December 2, 2014. Parikshit’s is a most unusual tale, in more ways than one. The posthumous son of Abhimanyu, Parikshit was given life by Krishna himself. Yet he died a most gory death, burnt to ashes because of the poison of Takshaka. Why? Because of the curse of Shringi, the son of sage Shamika. Yes, but why Takshaka, the serpent king? Well, one could argue that Takshaka’s abode, the Khandava forest, had been burned to the ground by Arjuna and Krishna. So what better revenge than to kill Parikshit—the grandson of Arjuna who had been given life by Krishna. But Takshaka per se is not what I want to dwell upon here. Let us take a brief look at the incidents that led to Parikshit’s demise. King Parikshit was “always addicted to hunting, like the greatly fortunate warrior and great archer, Pandu.” (is the reference to Pandu—Parikshit’s great-grandfather—coincidental? Perhaps not. Pandu also was set on the road to his demise as a result of a hunting expedition gone wrong—this is described in the Sambhava upa Parva of the Adi Parva) During one such hunt, the 60-year-old king wounded a deer, and deep in its pursuit, found himself tired and thirsty, and came across a sage. He asked him about the deer, but the sage did not reply as he had been observing a vow of silence. On not receiving a reply, Parikshit lost his temper, picked up a dead snake with his bow and placed it on the shoulders of the sage, and left. This act of the king was observed by a friend of the sage’s son and reported to him. Shringi, sage Shamika’s son, was “extremely powerful, with great energy and prone to extreme anger.” On hearing from his friend of his father’s insult, Shringi flew into a rage and cursed that “Within seven nights from now, the angry and radiant snake Takshaka will burn him down with the energy of his poison.” Shamika did not approve, but Shringi would not take his curse back, nor modify it. The sage then had a message sent to the king via a disciple, Gouramukha, and asked him to take all necessary precautions. These were incendiary words, clearly meant to incite Shringi. Why did Krisha use these words? Not all friends are equal. Perhaps Krisha had a motive, or perhaps he was envious of Shringi’s powers. We don’t know. The Mahabharata does not say more on the topic. Parikshit constructed a palace on pillars and had it guarded. As the seventh day dawned, sage Kashyapa headed towards Hastinapura to save King Parikshit—he had an antidote that could act against even the most virulent of poisons. Takshaka came across Kashyapa, and after witnessing the power of his knowledge, bought him off by giving him all the riches that he desired. Thus did Takshaka head towards Hastinapura. He sent some snakes in the form of brahmanas, bearing fruits as gifts for Parikshit, while he himself hid in one of the fruits. Parikshit’s guards were taken in by the disguise, and let in the brahmanas, who offered the fruits to the king and left. At this point, the sun was close to setting. There was no sign of Takshaka, let alone any snakes. Parikshit was in an expansive, magnanimous mood. As he picked up a fruit, a small worm appeared in the fruit. The palace itself was set on fire from the virulence of Takshaka’s poison. What did Parikshit do wrong? Insulting Shamika was of course one wrong. But after that, specifically, near his end, what did he do wrong? I can count at least three wrongs. All three can be attributed to his ego. First, the day was drawing to a close, but it was not yet over. Parikshit had let his hope overcome the need to stay on his guard till the very end. What harm could a few minutes do to him, or so he thought. Famous last words, shall we say? Note: I have used Dr. Bibek Debroy’s “Mahabharata”, Vol. 1, an unabridged English translation of the Critical Edition of the Mahabharata, published by Penguin India in 2010, for reference. The story here is described in the Astika upa Parva of the Adi Parva.